Finding north by the Northern cross is easy. Also known as the Cygnus constellation, this star grouping is visible here in the northern hemisphere from June to October. To find the Cross, look first for a star grouping known as the Summer Triangle, the corners of which are formed by three prominent stars--Vega, Deneb, and Altair. Vega is the triangle's leading star, and when high in the sky forms an east-west line with Deneb, the triangle's trailing star. This east-west line is of itself a good direction finder. Altair forms the Summer Triangle's southern corner. Deneb forms the head of the Northern Cross. 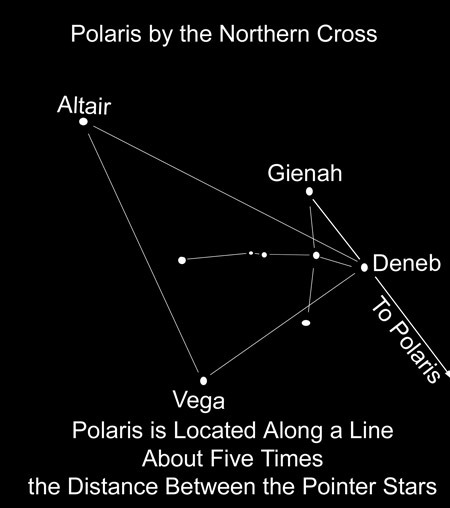 To find Polaris by the Northern Cross, start at Gienah--the star forming the end of the cross's trailing arm. Imagine a line extending from Gienah through Deneb at the head of the cross, and continuing straight out for about five times the distance between Gienah and Deneb. This line ends at Polaris.